The new Cinderella film is a fashion fairytale made in heaven, with designs created by multi-Oscar winner Sandy Powell. As the film hits screens today, we go behind the seams to reveal what actually went into creating Cinderella’s costume, worn by Lily James in the Hollywood reboot of the Disney classic. 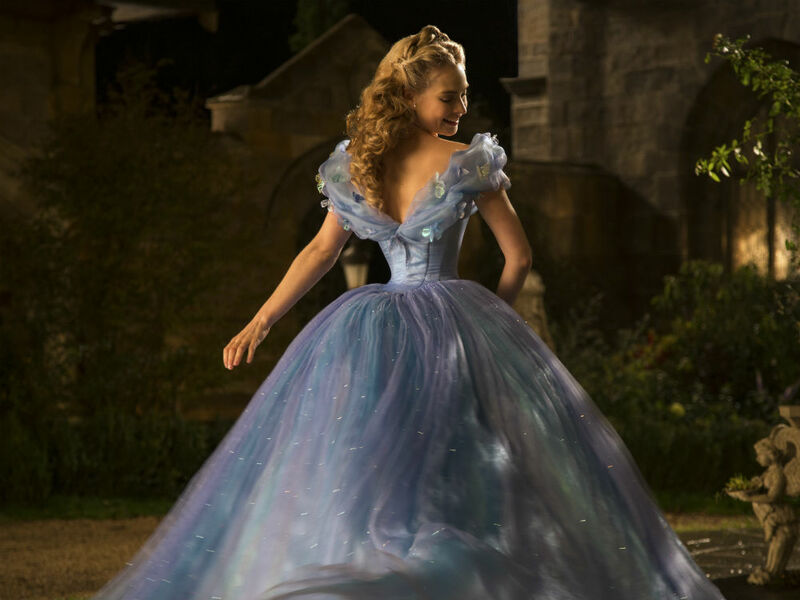 The new Cinderella film is a fashion fairytale made in heaven, with designs created by multi-Oscar winner Sandy Powell. As the film hits screens today, we go behind the scenes to reveal what actually went into creating Cinderella’s costume, worn by Lily James in the Hollywood reboot of the Disney classic. British costume director Sandy Powell may have won 3 Oscars for her unique creations on films including Shakespeare in Love, but says creating the iconic blue dress for Cinderella was no easy feat. “The bad guy is always the most fun to dress,” admits Sandy. “And the good, kind person is always the most challenging.” Powell says she wanted to create a look of a 19th century period film made in the 1940s or 1950s. Powell admits it took 20 people and 500 man hours to create the stunning multi-layered blue ball gown. It’s made up of 8 skirts – with a circumstance of just over 11m! You can always count on Swarovski to add some serious glamour to an occasion, and their partnership on Cinderella does not go unnoticed. Lily James’s powder blue shimmering gown was embellished with over 111,000 finely cut Swarovski crystals. 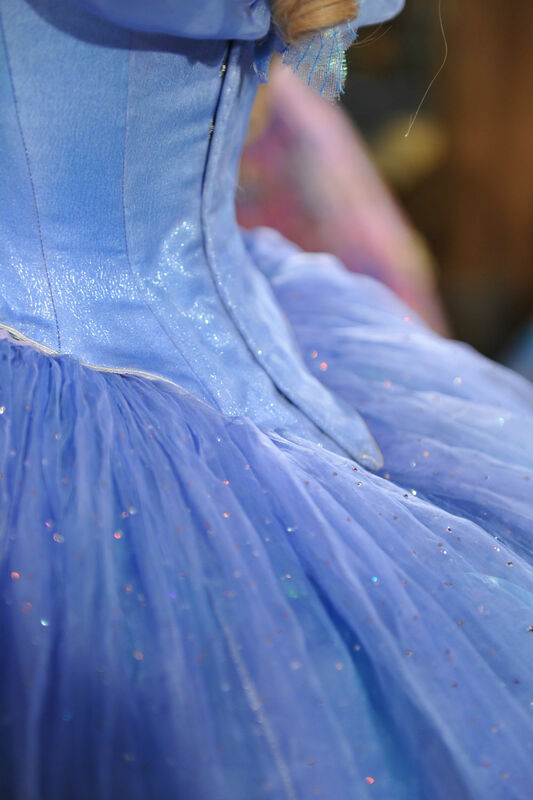 “Swarovski crystals are a key creative ingredient to add sparkle, depth and colour to my costumes,” says Powell. 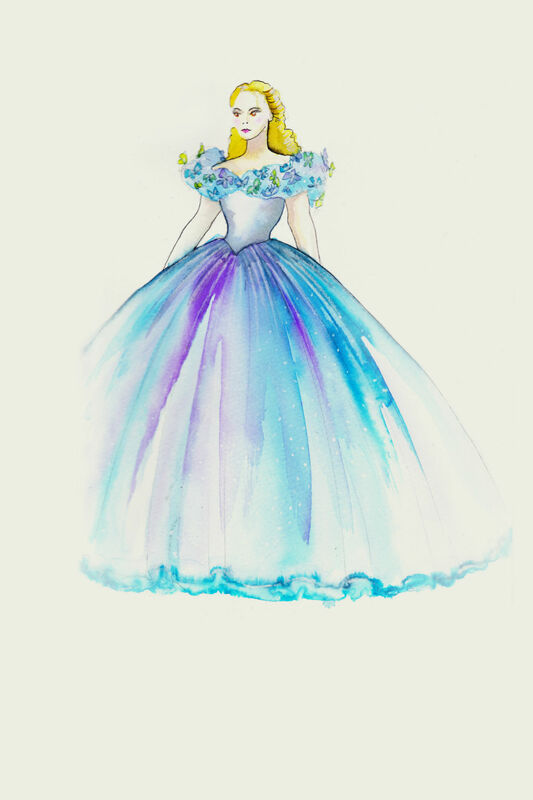 Powell collaborated with Swarovski to reinvent Cinderella’s iconic glass slipper, fit for a fairytale princess. Each bespoke slipper is made up of three crystal pieces. And approximately 150 hours were spent developing the perfect slipper, with six versions made before the final model was decided on. Although there’s been some controversy of late over Lily James’ tiny waist, which Sandy states is just an ‘optical illusion’ with zero CGI used, Cinderella’s shoes did need special effects. Lily wore leather shoes specially designed by Powell, which were later transformed into the sparkling slippers. The Cinderella Exhibition, presented by Swarovski, will be open until Friday 10th April. Admission is free but ticketed. For more info, visit: www.disney.co.uk/cinderellaexhibition. Cinderella hits cinemas on March 27.